RESIDENCE CORTINA 3 is an apartment with ski-to-door access in Puy-Saint-Vincent, a few steps from TSF2 de l'Escapade, a 2-minute walk from TSD4 de la Bergerie, as well as a 2-minute walk from TSD4 de la Crête des Bans. 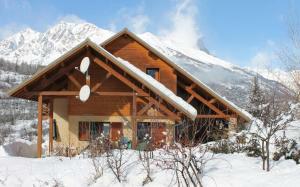 The accommodation is a 14-minute walk from TSD6 des Prés. This apartment has a sleeping area with bunk beds and a kitchen with a dishwasher and a microwave. There is a living area featuring 2 sofa beds and a flat-screen TV. TSF4 du Rocher Noir is an 18-minute walk from RESIDENCE CORTINA 3. When would you like to stay at RESIDENCE CORTINA 3 ? This apartment has a living area with 2 sofa beds and a dining area. There is a kitchen and a bathroom, as well as a sleeping area with bunk beds. Guests are required to clean the apartment before departure. Please inform RESIDENCE CORTINA 3 in advance of your expected arrival time. You can use the Special Requests box when booking, or contact the property directly with the contact details provided in your confirmation. This property will not accommodate hen, stag or similar parties. A damage deposit of EUR 500 is required on arrival. This will be collected as a cash payment. You should be reimbursed on check-out. Your deposit will be refunded in full in cash, subject to an inspection of the property. Each day we'll check prices and send you an email for your selected dates at RESIDENCE CORTINA 3. If you don't have specific dates but would like to check prices for say next weekend or say next month we can check the price too. Click to write a review and share your experience of RESIDENCE CORTINA 3 with other travellers.